I love ground chicken. I love ground turkey, too. Basically, I feel like the chicken has a slightly creamy texture when cooked with. I don’t even know how that’s possible, but beef seems too, basic. It’s almost like it’s drying. Which isn’t the case if it’s not in ground form. Obviously, I’m not talking about the super lean beef, but the ground chuck that you’re supposed to use for good flavor. Nope, I just can’t do it lately, I can’t cook with beef. I suppose that’s good for me, in the long run, so it works out. But I have to say, I’ve used ground chicken in pasta sauces, with lasagna, stuffed into peppers, and made chili with it. I’ve been working with ground turkey less than chicken, but today I’m returning to my old poultry friend in these delicious, and giant (!) meatballs. In a large bowl, using your hands, gently mix together first 11 ingredients (everything up to the olive oil). Shape into lacrosse-ball size balls (that would be somewhere between golf and tennis) and place a few inches from each other on a foil-lined baking sheet. Brush oil on top of each meatball (I just drizzled it around them and on top so some oil got under the meatballs as well. Bake for 15-20 minutes. 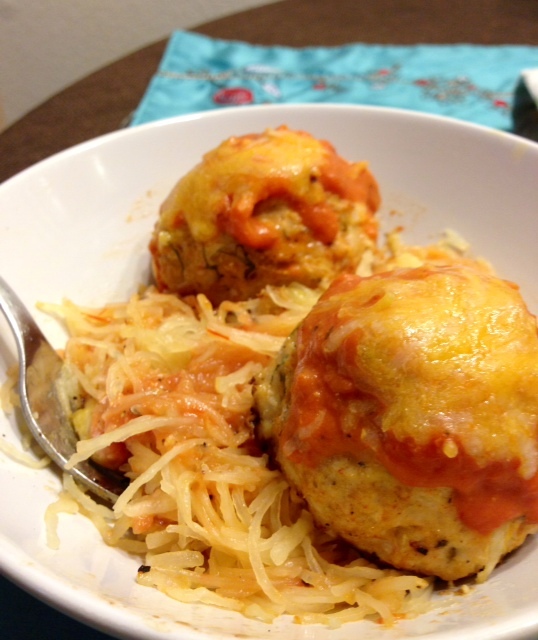 Serve with some pasta or potatoes. 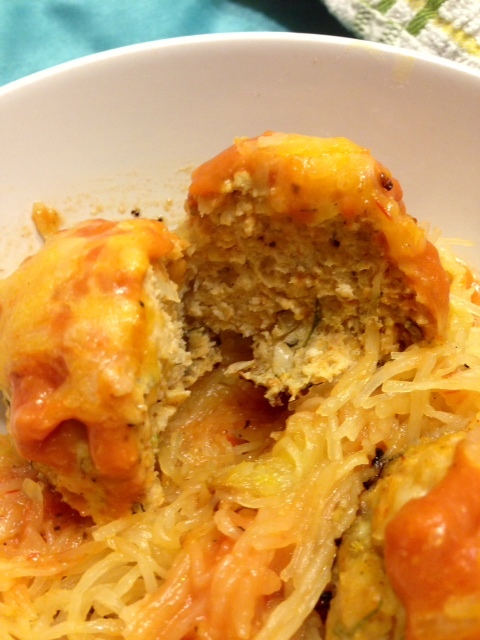 I used some spaghetti squash, to keep it healthy. 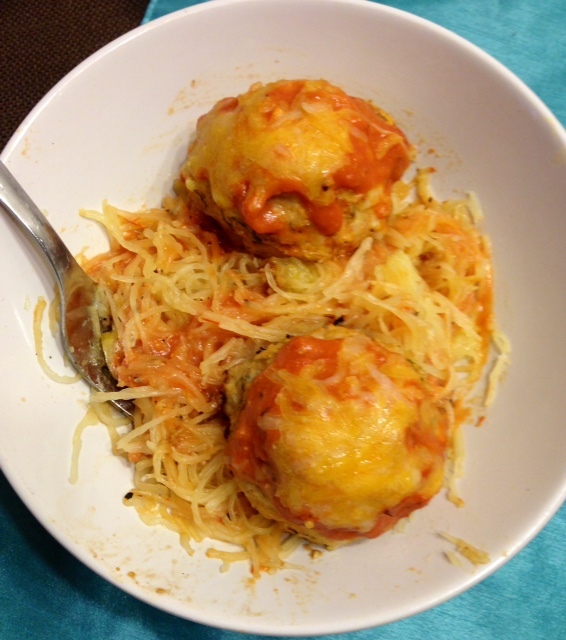 These meatballs (if the same, large, tennis ball size) are about 128 calories each. Two is more than enough, especially with a side, for a meal. 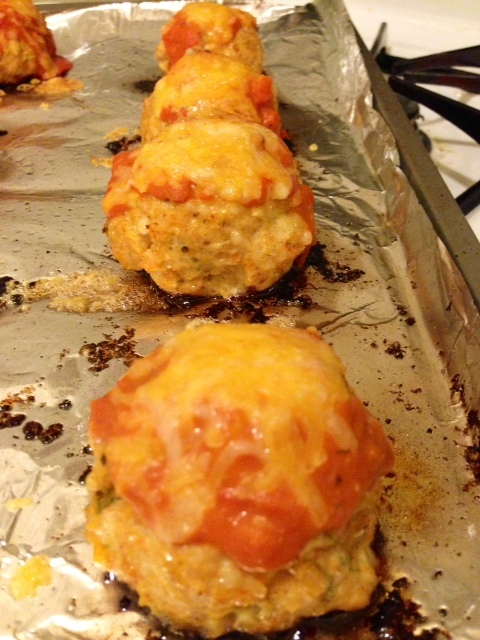 Posted in Cooking and tagged baking, cheese, chicken meatballs, chicken parmesan, cooking, dinner, food, ground chicken, healthy, lemon, meatballs, parmesan, weekend, yummy, zest. Bookmark the permalink. It’s blueberry season again. I know that last year I went a little crazy and although I only posted once last year about my jam, I continued to make it all summer long. Similarly was my obsession was apple butter two years ago. I couldn’t get enough of the stuff .This year I’m going to be adding a bit of rhubarb to my jam, as well as a whole vanilla pod. This way I can get more of the creamy, vanilla flavor to balance the sugar necessary for the rhubarb to be sweet enough to be edible. Place everything but pectin in a dutch oven and slowly heat on stove, over medium heat. After ten minutes of warming the fruit should be releasing the juices. Add in the pectin and stir. Let bubble away slowly, about thirty minutes, keeping an eye to make sure it doesn’t stick. Continue to cook till desired consistency is reached, about 1.5 hours. Using a potato masher, attempt to pulverize the fruit that is now lovely, and soft. Using a whisk add in juice of one lemon with zest. The Whisk will allow the fruit to soften even further. To test that the jams doneness, place a plate in freezer for ten minutes. Take out and add a line of jam (about a teaspoon) to cold plate. Let sit for a few seconds, and move plate around to see if the jam has set. If it has, you’re all set for canning! If not, bubble away a little longer and retest (there is too much natural juice that needs to evaporate). 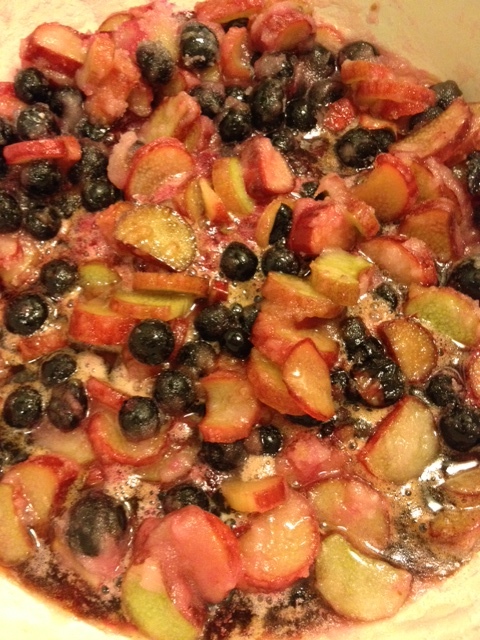 * The rhubarb gives off A LOT of juice, therefore the sugar is not enough to solidify it. The extra use of the pectin here will help with that. 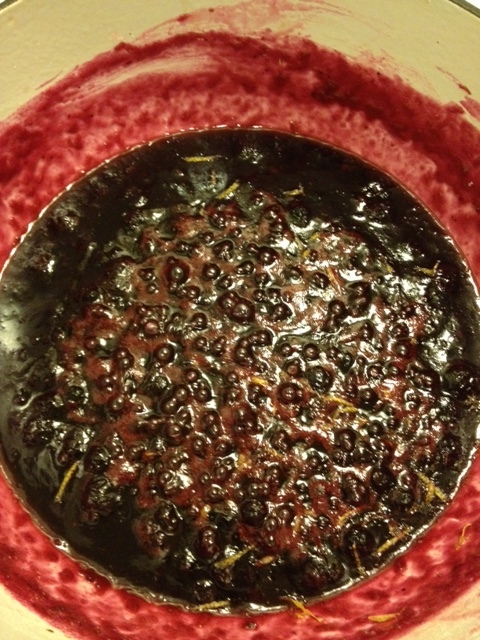 Posted in Cooking and tagged blueberries, homemade, jam, lemon, rhubarb, rhubarb and blueberry jam, rhubarb jam, summer, vanilla. Bookmark the permalink. There are days when I don’t want to be homemade. I don’t want to make everything myself, and marvel at how much better everything tastes. I also have days were making you’re own tomato sauce just seems like it’s too much of a hassle, even for me. Even adding extra oregano is a chore. However, I do still have to eat. And on the days that homemade is too demanding I got for my partly-storebought-home-assembled dishes. 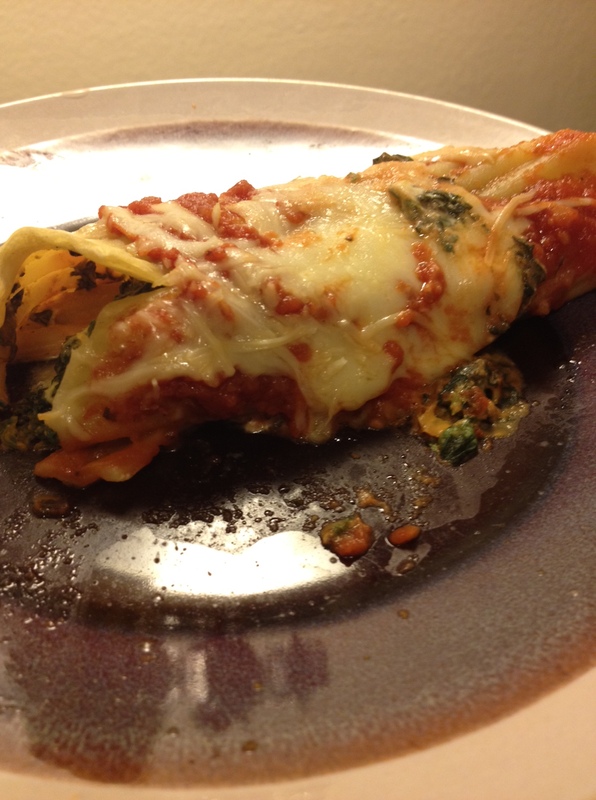 This manicotti dish has almost nothing in it that’s homemade, and perfectly original, it is however, delicious, easy, and takes only 15 minutes to put together. Add all the filling ingredients into a bowl and mix together. Set aside. Prepare an 8×8 inch square dish. By prepare, I mean, simply add 1/4 cup of tomato sauce to the bottom instead of oil. This will keep the manicotti from sticking and also keep it moist. Stuff the manicotti, by using a teaspoon, and slowly adding the mixture into the hole. If this doesn’t work, you can always open up the manicotti and stuff it that way, and then close it back up. The stuffing should keep it together, because it’s very sticky by itself, thanks to the cream cheese. Cover with tomato sauce when all manicotti is stuffed and in the pan. Sprinkle with mozerella and parmesan cheese, to your preference. I usually prefer tons of cheese! 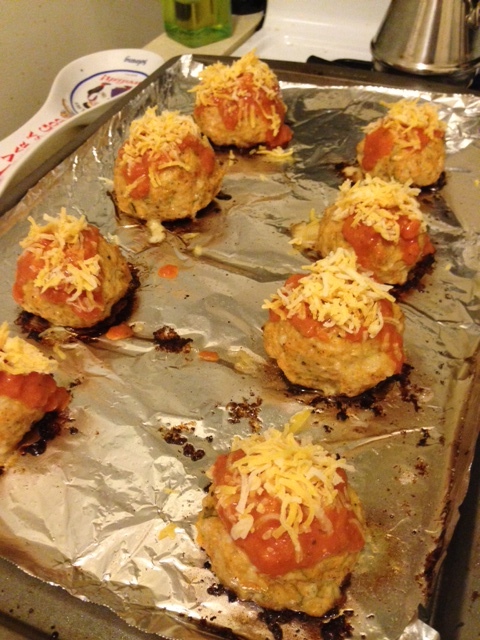 Bake in over for 25 minutes, till cheese is melted. 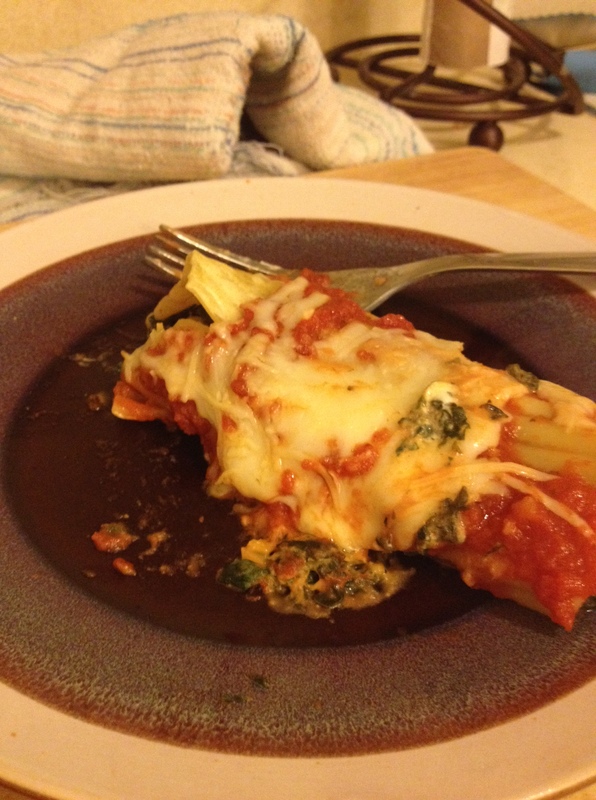 Posted in Cooking and tagged baking, cheese, cream cheese, dinner, easy dinner, lazy cooking, lemon, manicotti, mozerella cheese, parmesan cheese, pasta, spinach, stuffed manicotti, stuffed pasta. Bookmark the permalink. I woke up today with the urge to do something really nice, and something that dealt with lemons. 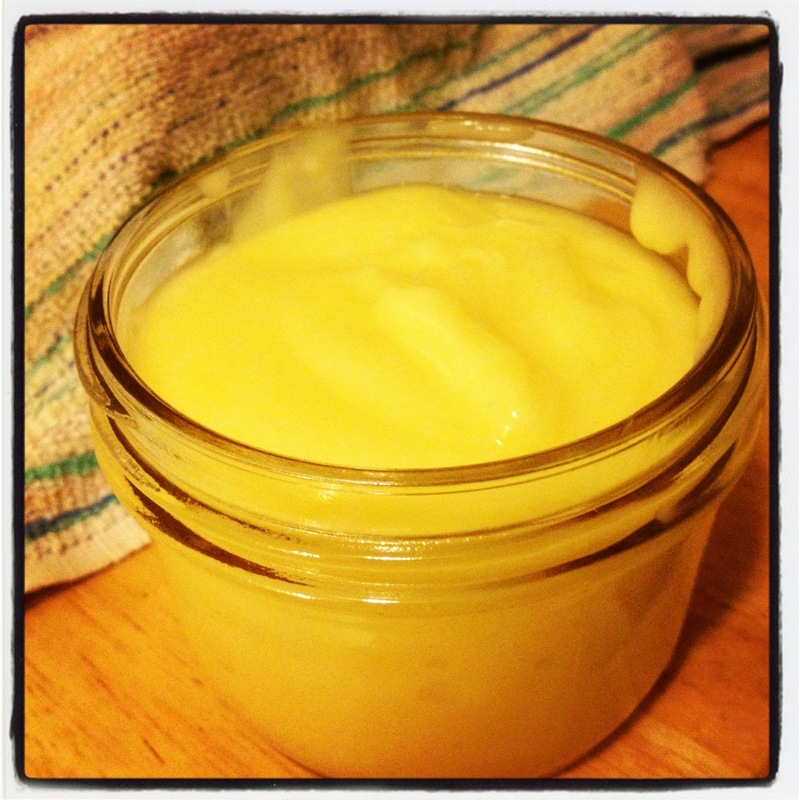 At first, and for a while, I’ve been tinkering with the idea of having my own recipe for Lemon Curd. I was gonna tweak and combine a few that I’ve tabbed over the days to make my own, perfect for tarts in the summer. As I was relaying what I thought was good news to Boyfriend, he said he wanted Lemon Pudding. In fact, he was craving it and he’d get himself some of the Jell-O brand (probably tomorrow). Now, I’m not sure if he actually got any, as this took place yesterday, but I was a little insulted at the thought of him buying ready-made pudding. I’ve been on this kick of “everything homemade” and it’s been great. It’s tasted a lot better and been a lot healthier, too. 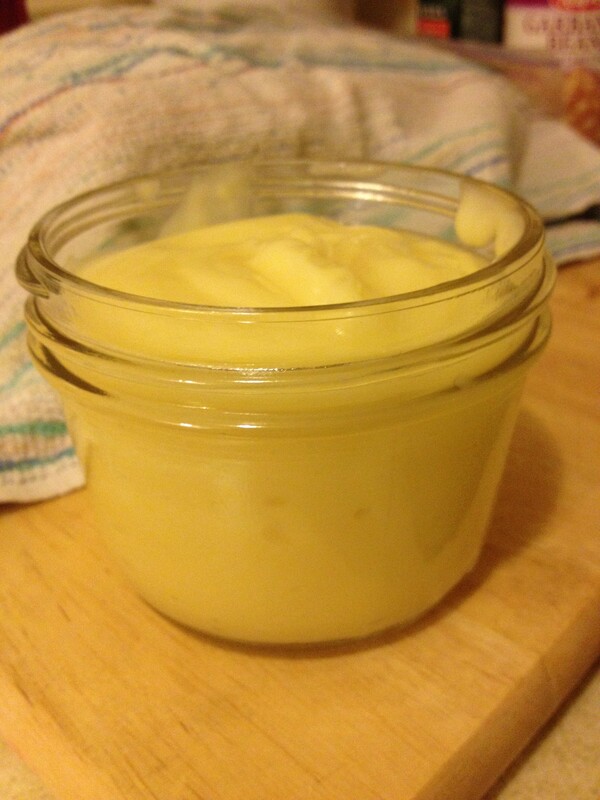 So as I was going over my Lemon Curd recipe I decided to flip the recipe and make Lemon Pudding instead. 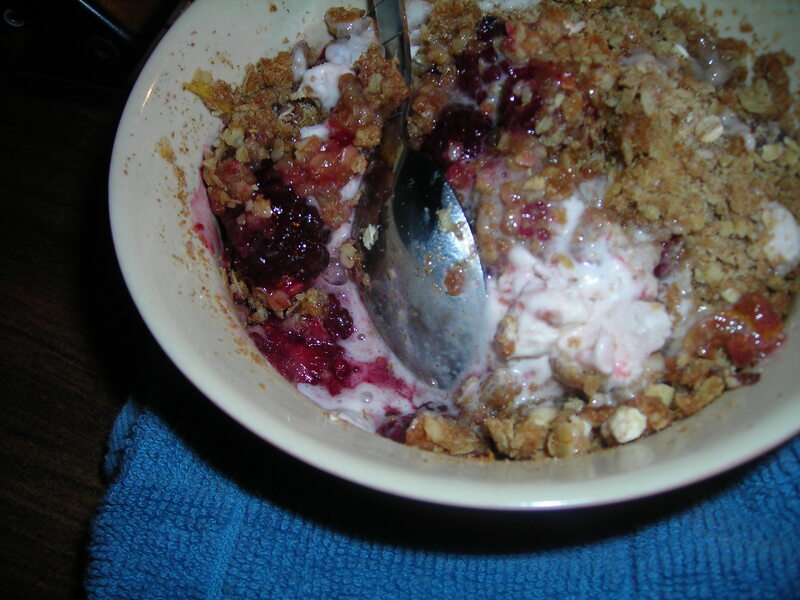 I’ve adapted the recipe somewhat from one that I found on FoodGawker. Place sugar and cornstarch in a saucepan. Whisk to combine the two. 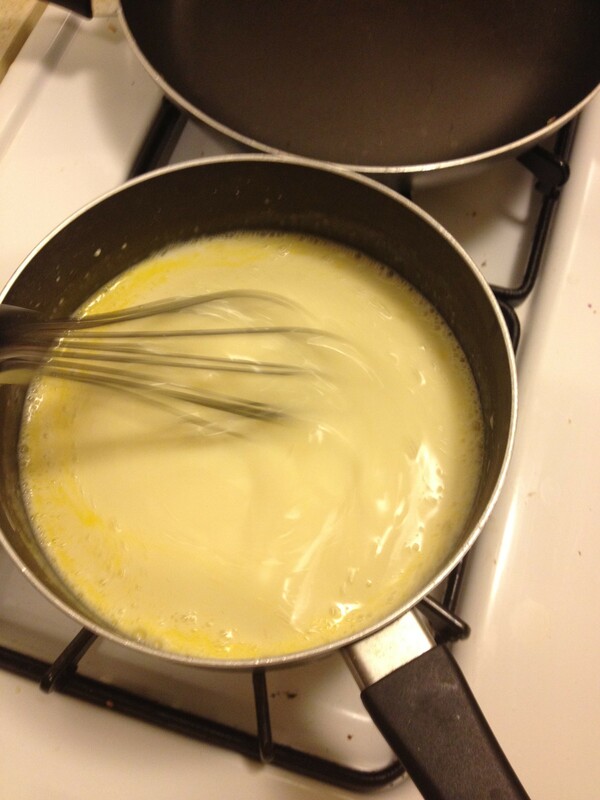 Gradually add the milk, whisking until smooth. This will take a few minutes so be patient. Add egg yolks, lemon zest, and salt. 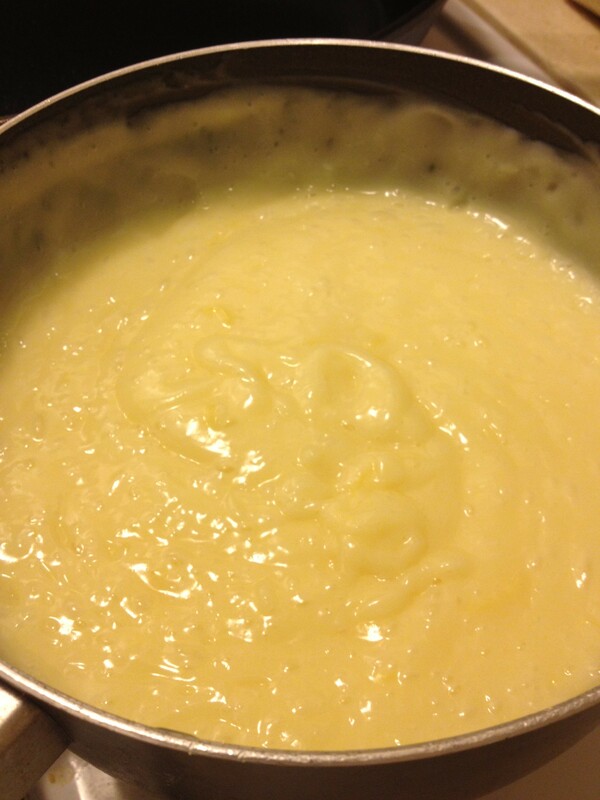 Cook on medium-high heat, stirring constantly, till sauce thickens, about 6-7 minutes so be patient. You’ll know it’s done when it can coat a spoon. Remove from heat and stir in the lemon juice and butter. Whisk to make smooth, about 20 seconds. Place in jars (about 3-4 1 pint jars). Let cool completely, and then cover with plastic wrap or lid. Refrigerate for a minimum of 2 hours, or overnight, till set. Serve chilled. Posted in Cooking and tagged butter, coconut milk, cooking, homemade, lemon, lemon juice, lemon pudding, requests, secret ingredient, stovetop, zest. Bookmark the permalink. Today was one of those days. Actually, it was a full 48 hours, where I’ve been getting bad news after bad news, from all corners of the bad news spectrum: financial, medical, scholarly, and familial. I haven’t been dealing with it quite as well as I would have hoped, just because it’s hard to handle it all, without going completely mad. And I’ve gotten to that point, twice, today. An hour or so ago, I was able to pull myself up out of the disaster and stop feeling sorry for myself. I looked up a few things online and turned on my Nigella show, and started to pick up the pieces again. I organized and Post-It’d everything I could imagine that needed to be sorted through, organized, and managed, and then I found this recipe. 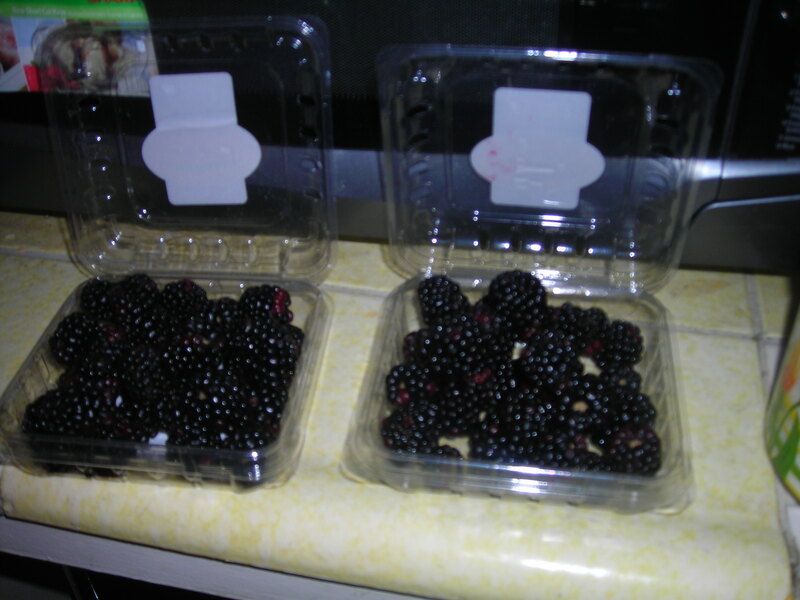 It’s perfect for one of those days, and I just about over 2 cups of Blackberries waiting to be used up, and baked. I also added some cardamom, about 1/7 teaspoon. 1. Preheat oven to 375 degrees. Butter a 1-quart baking dish (or as I did, which was in two 16 oz. ramekin dishes). 2. 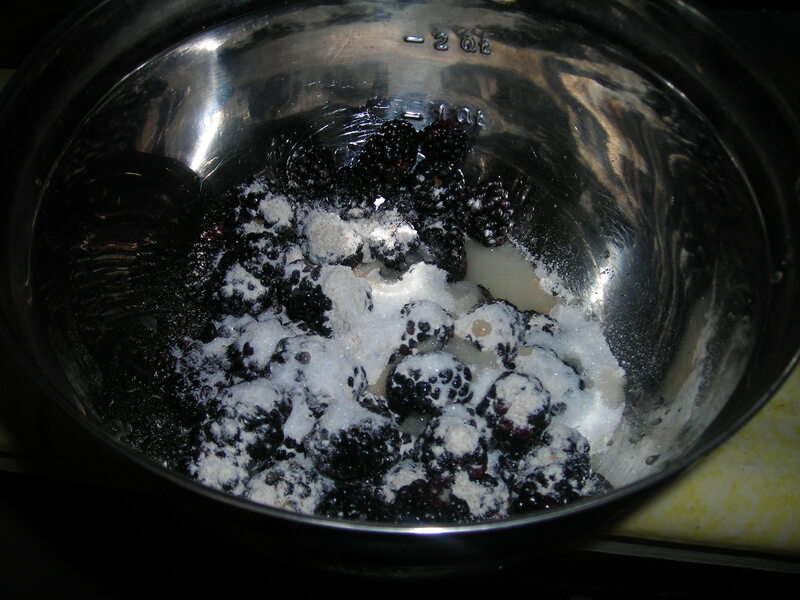 In a small bowl, toss together blackberries, lemon juice, sugar, scant tablespoon of flour, cardamom (if using), and small pinch of salt. 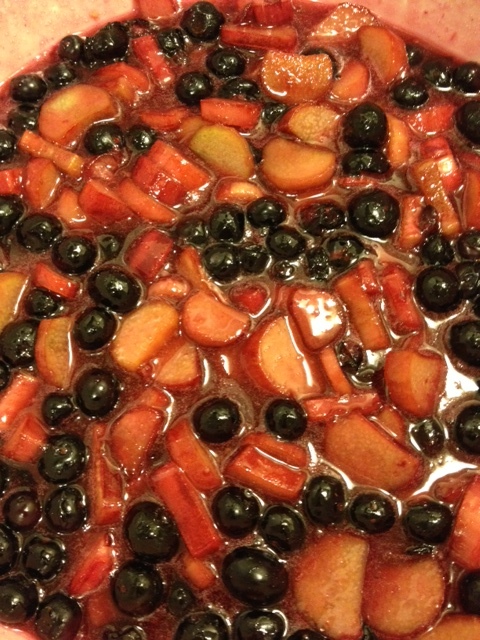 Pour berry mixture into a greased 1-quart baking dish or divide between the ramekins. 3. In a separate small bowl, stir together oats, 1/3 cup flour, brown sugar, cinnamon, and lemon zest. 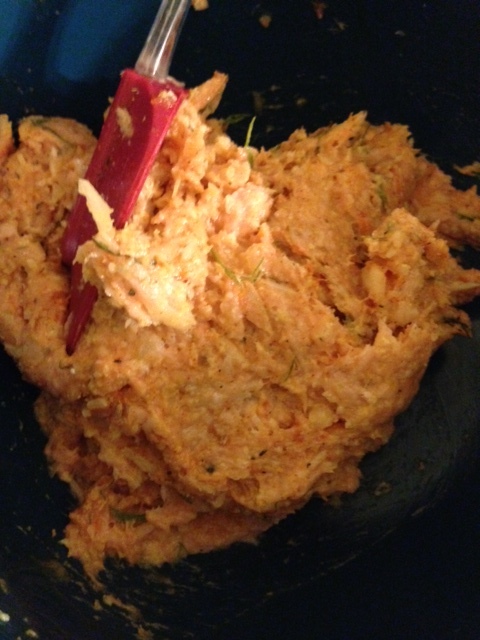 Add pieces of cold butter and cut in using a pastry blender or two knives (or rub in with your fingertips) until crumbly. Sprinkle topping over the berries. 4. 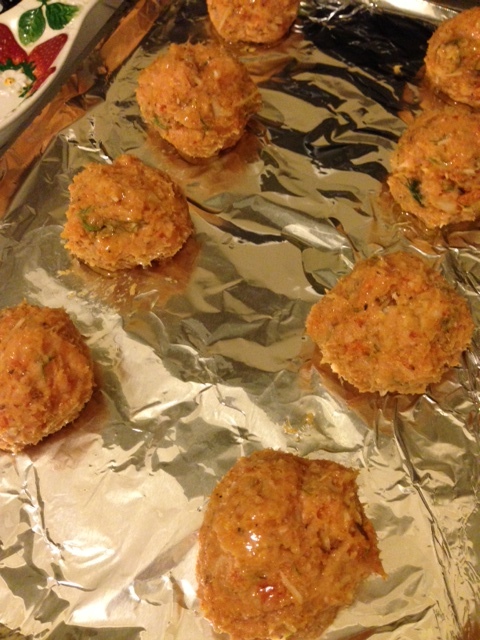 Place baking dish(es) on a sheet pan and bake, uncovered, at 375 degrees for 20 – 25 minutes, or until filling is bubbly and topping is lightly browned. Serve with vanilla ice cream. 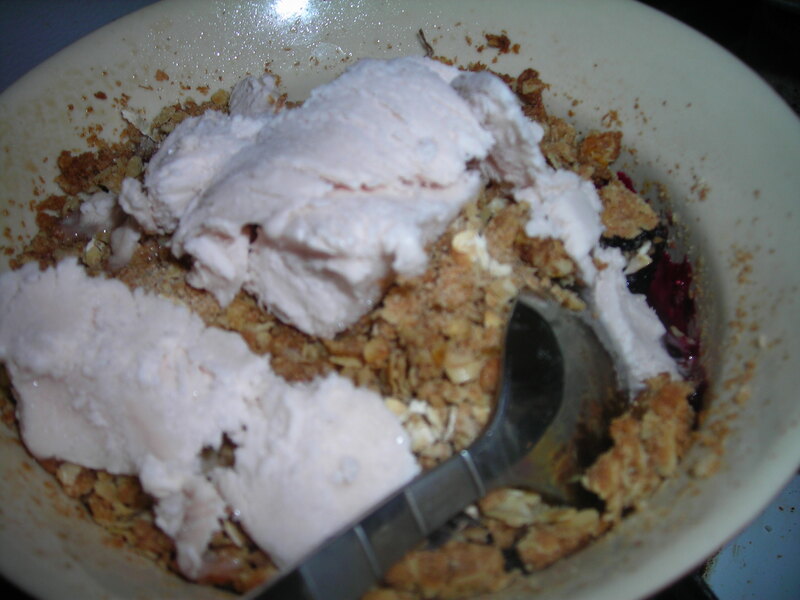 I don't have Vanilla Ice cream, but my homemade Pomegranate works just as well. 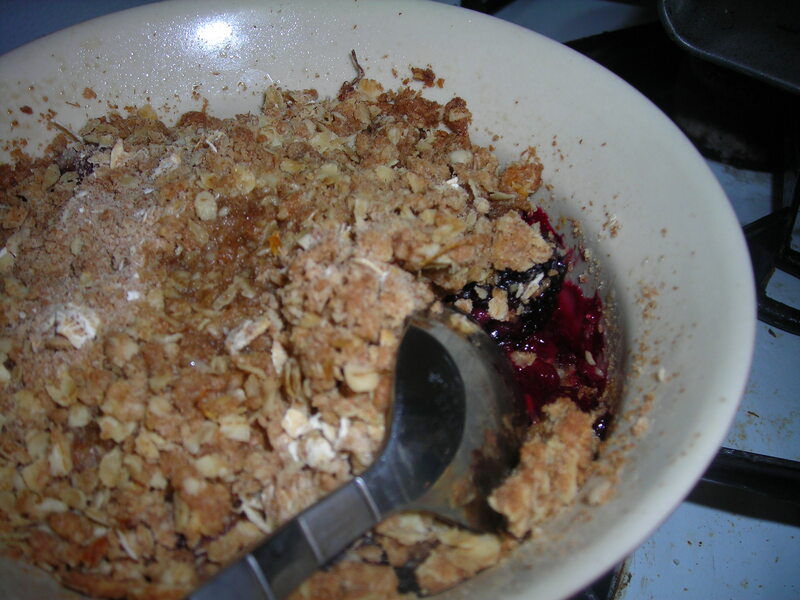 Posted in Cooking and tagged bad days, baking, blackberries, cardamom, crumble, lemon, nigella, oats, whole wheat flour, worries. Bookmark the permalink.